Is there a better Christmas musical than this? I think not. It stars Bing Crosby and Danny Kaye, along with Rosemary Clooney and Vera Ellen. It again features the songs of Irving Berlin, so you know you’re in for some gems. 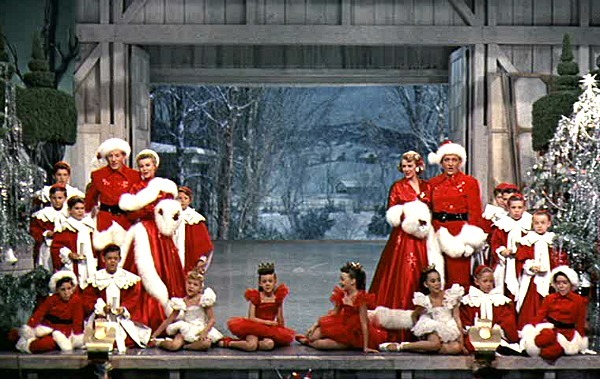 It’s supposed to be a very loose remake of Holiday Inn, in that it also centers around an inn (in this case, a ski lodge, actually) and features the song “White Christmas”. See? Didn’t I say they loved repeating songs in the old days? But it’s a great one, so we don’t mind. It starts with that very poignant song, “The Old Man”, an Army division’s tribute to a much-loved retiring general. Crosby plays Bob Wallace, and Kaye is Phil Davis. They’re a captain and private, respectively, serving in World War II. It’s Christmas Eve on the front, so they put up a bit of a show for the troops. Part of the show is a farewell tribute to their commanding general, General Waverly, who is being replaced. The show is interrupted by bombs though, and in the confusion, Davis manages to save Wallace who would have been killed. This bit of heroism serves as a running gag throughout the film, as Kaye always uses this whenever he wants something from Crosby. They make it to V-E Day, and they start a career first in radio, then as big-time producers. Enter the Haines Sisters (Clooney and Ellen), who use their brother’s old Army friendship with Wallace and Davis to get an audition. Of course the pairs are smitten (Crosby with Clooney, Kaye with Vera Ellen) and Davis decides that they will follow the sisters to their Christmas gig in Vermont. And who do they find as the innkeeper? General Waverly! 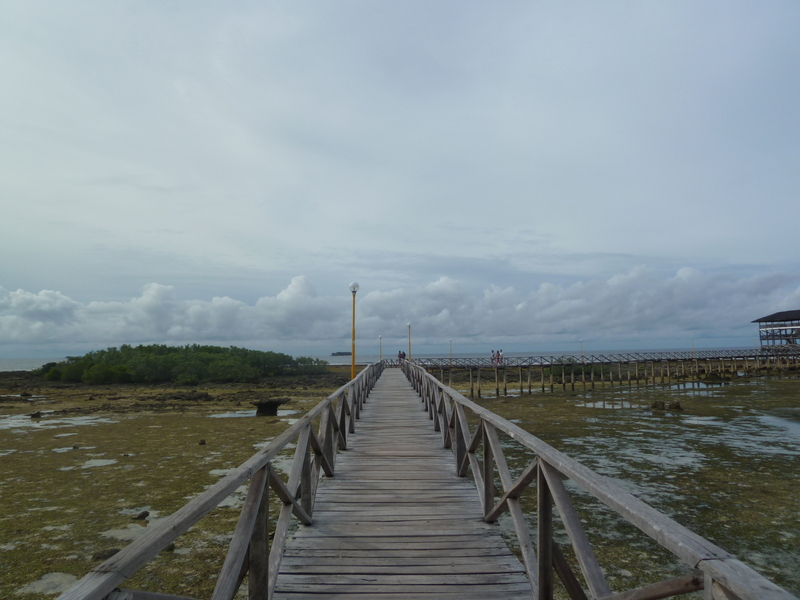 But there is no snow yet, which means business is bad for ski lodges. So Wallace and Davis contrive to bring their Broadway show to Vermont to drum up some business for the general. Musical numbers include “Count Your Blessings” with Crosby and Clooney, and “Snow”, where all four are happily anticipating all the winter fun they’ll have in Vermont. 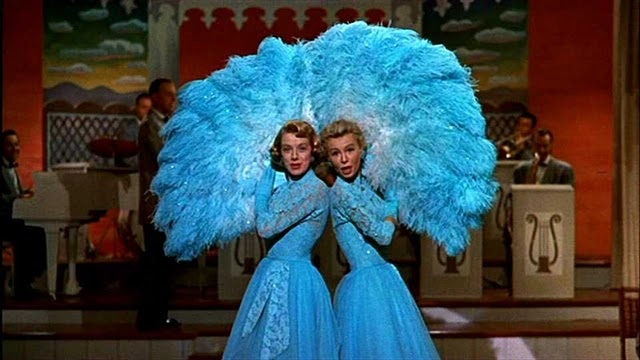 But the highlight is “Sisters”, which Clooney and Vera Ellen perform first. But through some shenanigans, Crosby and Kaye clown around a little and lip sync to the song too, which is one of the moments where we just roll around laughing, no matter how many times we’ve seen it. Supposedly it wasn’t part of the script, but when Crosby and Kaye were joking around on set, the director liked it so much he included the number in the film. The scene had so many unscripted moments, and you could really see that Danny Kaye was cracking Bing Crosby up so much. Another standout is “The Best Things Happen While You’re Dancing”. Not only is it a very beautiful and sophisticated song, but it showcases an extended dance between Kaye and Vera Ellen. We all know Vera Ellen is an amazing dancer, but I had no idea Kaye could dance too. I am amazed every time I watch the scene, because he moves so gracefully. 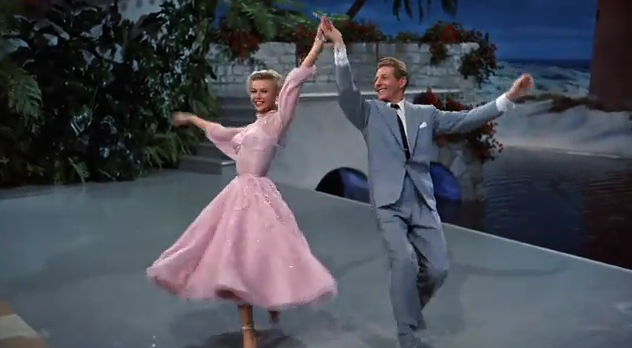 Also, Vera Ellen’s pink dress, with its ruffles in darkening shades of pink, is gorgeous, and complements Kaye’s gray suit and shoes perfectly. I also love the quartet’s performance of “Gee, I Wish I Was Back in the Army”. Their chemistry is just so wonderful to watch. General Waverly is played by Dean Jagger, and I swear you’d think he’s a real Army man with his bearing. 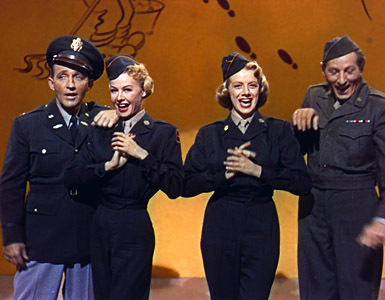 Wallace and Davis’ efforts to help the general with his business, and to boost his failing morale when he thinks he’s no longer valued as a faded general, leads to the last and most emotional number in the film. Wallace and Davis contrive to get most of their old Army buddies living in the New England area down to the inn, to help the general see how much he’s loved. They surprise him with a reprise of “The Old Man”, and the way Dean Jagger teared up when he saw his troops will surely melt any jaded heart. 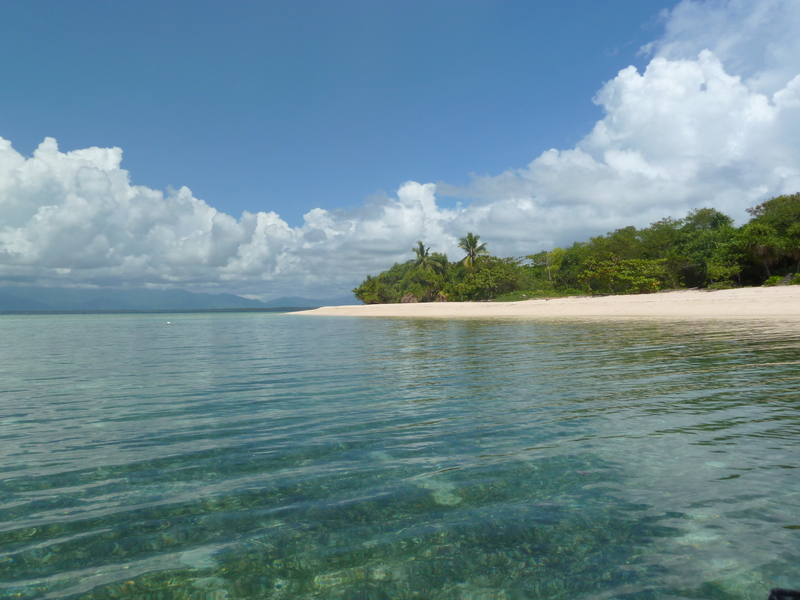 Because again, a picture is not enough…SNIFF. Of course the movie closes with snow finally coming to Vermont, and the quartet leads everyone in singing “White Christmas”. This scene has to be one of the most iconic in holiday filmdom, with their red and white Santa-inspired suits, that gigantic Christmas tree, and the snow falling in the background.